Do you wash your face regularly, but still get the feeling that your skin isn’t truly clean? Even with a great cleanser, washing your face by hand still leaves behind a lot more dirt, grime, and dead skin than you may think. It’s not that you’re doing it wrong, it’s just that you have the wrong tool. Increase the absorption of creams, serums, etc. 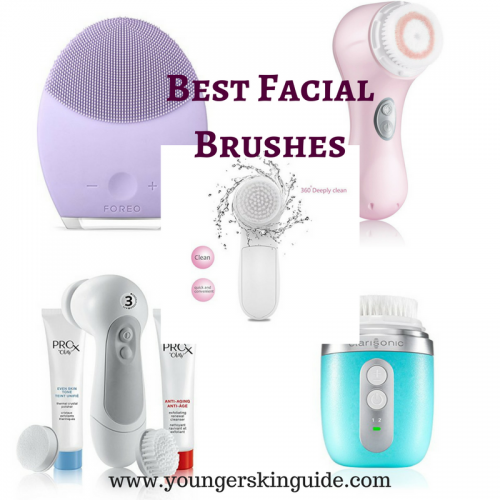 When it comes to choosing the best facial brush for you, there are a number of different options on the market that fit all skin types and budgets. If you’re not sure how to decide though, continue on for our in-depth guide for the best ones available, along with a comparison chart, feature guide, and FAQs. 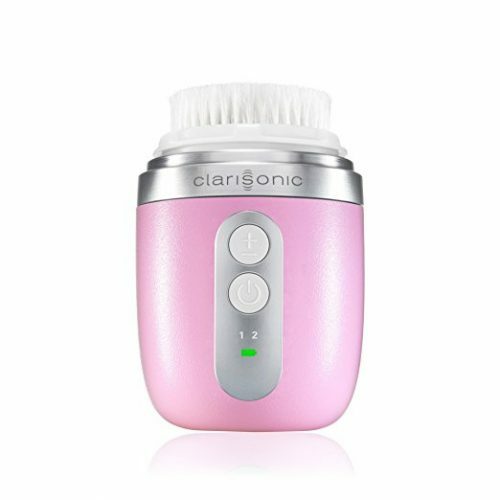 If you are looking for a high-quality, professional-grade facial brush, then the Clarisonic Mia2 is a great choice and it is the #1 device recommended by dermatologists. It comes in four colors – pink, green (sea breeze), purple (lavender), and white. It uses an oscillating movement to gently remove dirt, grime, makeup, and more. It’s suitable for all skin types, being gentle enough even for the most sensitive of skin. 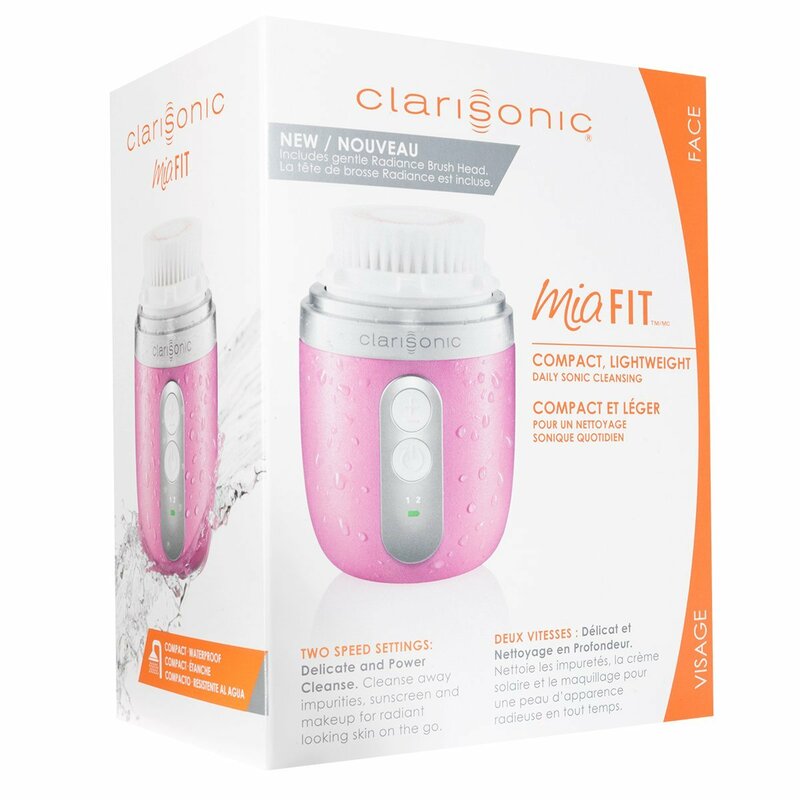 If you already have or have heard of the Clarisonic Mia1 and are wondering what the difference between the two are, the Mia1 has only one speed, while the Mia2 has two speeds. While this may not sound like a big difference, this allows you to have a softer speed for more sensitive areas or if you have sensitive skin. I love having the choice available. 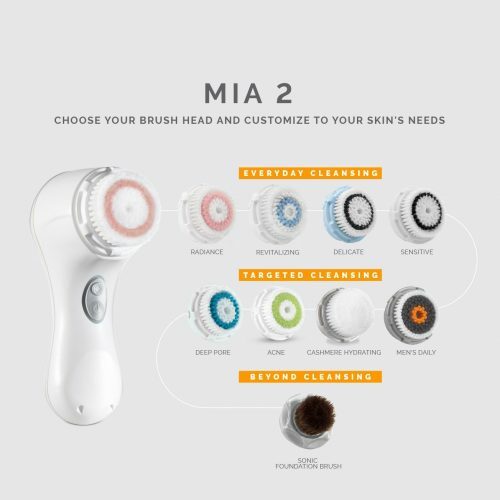 What’s great about the Clarisonic Mia2 is how many different brush options it has. With 9 different brushes available currently, the Mia2 can be used for all your skincare needs. There are brushes for everyday cleaning, sensitive skin, deep cleansing, and even a makeup blending brush! This makes it one of the most versatile options that you have available to you when it comes for a facial brush. 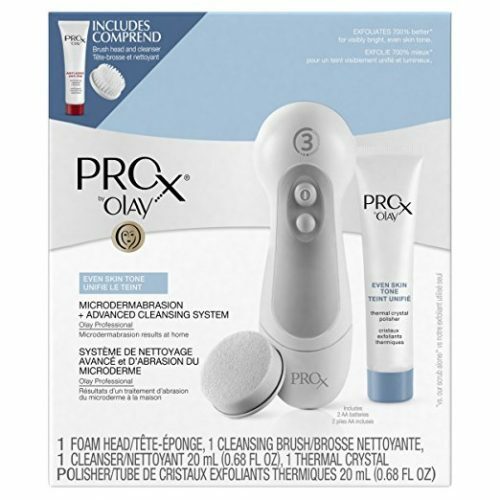 If you are looking for a complete facial cleansing kit, then the ProX by Olay is a great choice. 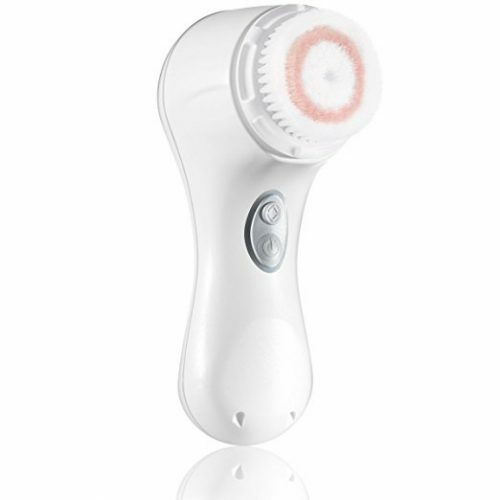 Not only is it a great facial brush system, but is also a microdermabrasion system, too. 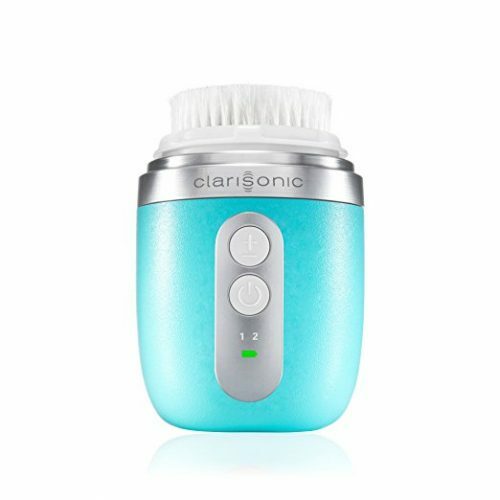 This clinically tested system allows you to have your daily facial cleanse, along with a microdermabrasion system, which can be used up to twice a week for noticeably brighter skin within a week, all in one easy-to-use tool. It has three speeds, with the highest speed specifically for the microdermabrasion system (though this doesn’t mean you can’t also use it with the facial brush) and a lower setting that is perfect for those with sensitive skin. 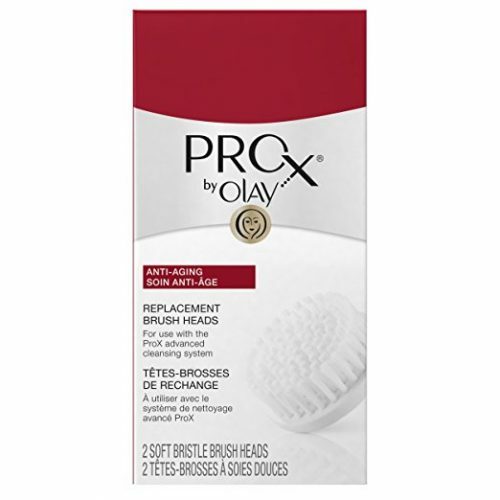 It comes with two different Olay products to use with the brush – one for cleansing and one for microdermabrasion. The one for microdermabrasion is a thermal polisher, which is really nice, as it is self-warming and feels great on the skin. 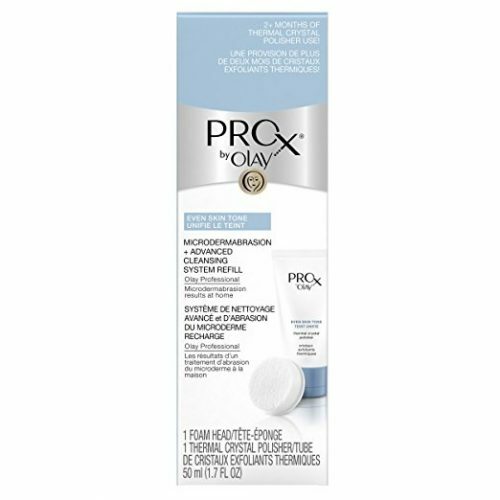 If you love Olay’s ProX system, but aren’t interested in microdermabrasion, they have a ProX system without that feature here. Love the Mia, but hate the size? This the option for you! 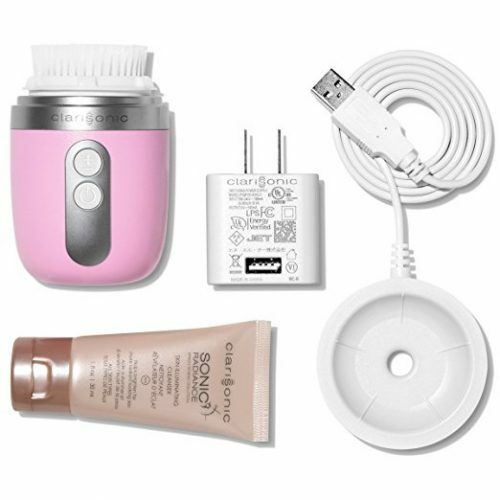 The Mia FIT is one of the smallest powered facial brushes that I have ever seen, but don’t let its small size fool you. It still has plenty of power and will give you the glowing, beautiful skin you desire. I love the Mia FIT for space-saving. When you have a small vanity – or just too many other things sitting on it – adding another tool, no matter how beneficial, can be a pain. When it comes to a facial brush, you’ll want to use it regularly for the best results. In my experience, it is really hard to make a habit of using it if it is not in view, so if space is an issue, then a compact option like this is great. It is also great if you are looking for a more portable device, such as something to pack in your gym bag or when you travel. The Mia FIT offers all of the same great options as the full-size Mia. It has 9 brush head options, such as those for daily cleaning, sensitive skin, acne, and a make-up blending brush. It is gentle enough to be used twice a day. Also, its two-speed settings are perfect for people with more sensitive skin. For the favorite man in your life, there is also a version for guys! The LUNA 2 is made of silicone, making it very hygienic (35x more than standard brushes!). Also, due to its design, there are no brush heads to replace, reducing your long-term costs versus other options where you need to replace your brush heads every 3 months. There is also a men’s version! To use it to its best effect, first, apply your favorite cleanser to your face. Then, use the brush side of the LUNA 2 to clean your face for about a minute, usually circular movements. Afterwards, rinse and dry your face. At this stage, you can apply any other products you normally would after cleaning your face, such as your favorite moisturizer or serum. Then, use the LUNA 2’s anti-aging side on any areas of your skin that have or are most prone to wrinkles, again for about 1 minute. 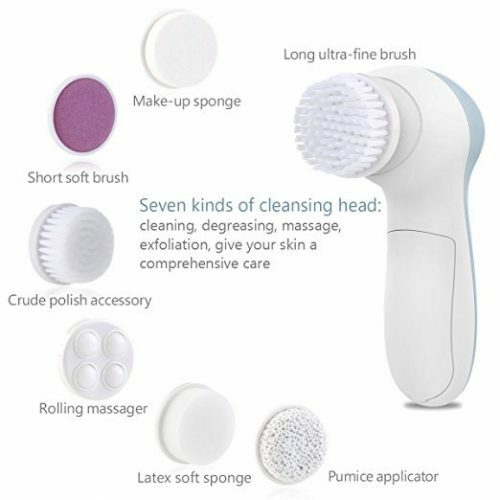 While this facial brush does not have the same quality or power as the more expensive options, I find it to be a great intro into the use of facial brushes. If you’re unsure of whether or not you actually want to make the investment yet, give this one a try, but remember you’ll be getting a lot more out of the other options reviewed here. 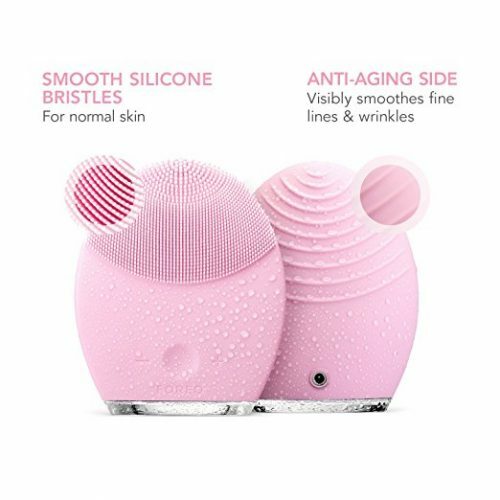 When you are looking to buy a facial brush, there are a number of different features that you should keep an eye out for. These include: number of speeds, number of brushes, its level of waterproofing, and power method. When looking at facial brushes, you’ll want to understand how many different speeds it has. This is important for understanding how you will best be able to use your new tool. While a single-speed facial brush is ok, in this case, more IS better. Generally speaking, look for a facial brush with at least two speeds, especially if you have sensitive skin. When you have the option of at least two speeds, you have a softer setting, which can be better for someone that has sensitive skin. However, not only those with sensitive skin will benefit from the option of multiple speed settings. A lower speed setting is also helpful on more sensitive areas, such as closer to the eyes. While 1 or 2-speeds is most common, there are also brushes with additional speeds. These are beneficial when you’re looking for even deeper cleaning. The number of brushes that are available is another important feature to look for when choosing a facial brush. Most facial brushes tend to come with only one or two brushes when you purchase them initially, but what you want to look for is how many different kinds are available as a whole. The different brushes each have their own uses and benefits, and having a wide variety of choices helps your new facial brush to be a bigger part of your overall skincare routine. Look for one that has brushes that fit your unique skincare needs. For example, there are brushes for sensitive skin, everyday cleaning, specific skin issues like acne, etc. Some even have brushes for other needs, such as applying your makeup. While a larger variety tends to be better, it is much more important that the brushes available are the ones you need, so don’t just go with whichever has the most if it doesn’t have the ones you need. While the overall number available is important, it is also nice when your facial brush comes with a few to start with, allowing you to save money on additional brushes up-front. If you are looking to use yo ur new facial brush in the bath or shower, waterproofing is a must! I love the convenience of taking a facial brush with me into the shower. I actually prefer this, as it can sometimes get a bit messy just at the sink and using it in the shower helps with that. Be sure to check if the brush is fully waterproofed or just water resistant. If it is just water resistant, then it cannot be submerged in water, such as in the bath, so you’ll want to be much more careful. However, it should be fine in the shower. If you think you’ll be wanting to use it in the bath, then I highly recommend choosing one that is waterproofed. The method of power that a facial brush uses is another factor to consider. Wherever possible, I highly recommend something that is cordless. 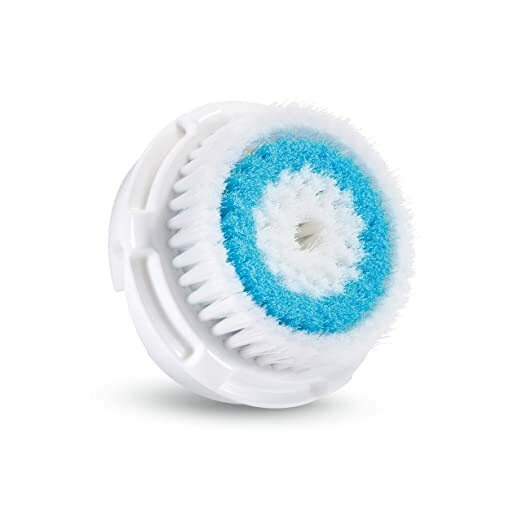 This not only allows you to use your facial brush in the shower or bath, assuming it is also waterproof, but also makes it much easy to maneuver and use even just at the sink. When it comes to wireless options, there are two styles that you’ll see – rechargeable and battery-operated. My personal favorite is rechargeable, so I don’t have to mess with or bother with batteries. However, if you have a small vanity, then you may prefer using something that is battery operated, so there is no need to create space for a charging dock. How do I use a facial brush? 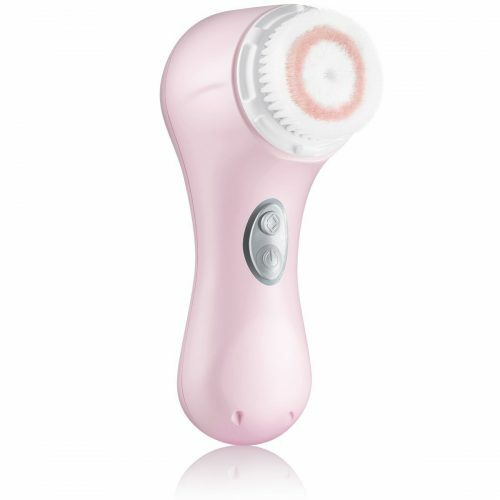 Turn it on and apply gentle pressure to your skin. You don’t want to press too hard and it’s not necessary to. If you find that you’re slowing down or stopping the brush’s movements, then you’re pressing too hard. How do I clean a facial brush? To ensure that your facial brush and brushes last a long time, you want to make sure that you are taking care of them properly. For the facial brush machine itself, be sure to keep it dry when it is being stored. Many facial brushes are waterproofed, or at least water-resistant, so don’t be afraid to get them wet. However, don’t store them in the shower or bath. 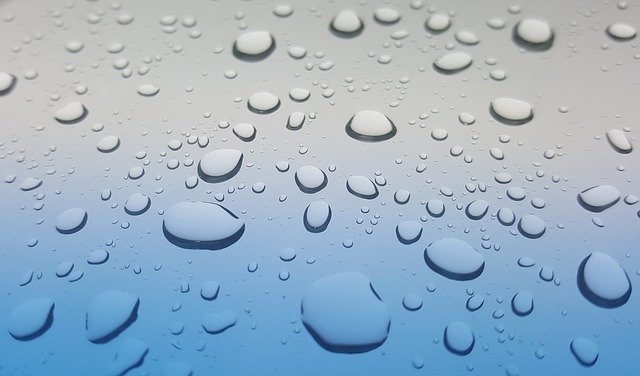 If very wet, give it a quick dry before storing it or leave it in a clean, dry location to air dry. For the brushes, clean them at least once a week using a gentle soap and warm water. Thoroughly rinse them off and allow them to dry. You’ll find that some people complain of their brushes getting a mildew smell, but this is easily preventable with proper care. Also, be sure to replace them regularly. If this is a concern, though, check out a silicone-based brush, such as the FOREO LUNA 2. How often do I replace facial brush brushes? It is important to replace your facial brushes on a regular basis. This ensures that you are using clean brushes remain effective. This helps you to get the mos t out of your facial brush, while also keeping your skin healthy. Each brush may have its own recommendation on how frequently you should purchase new brushes, but on average, you should replace your brushes approximately every 3 months when you are using them regularly (3+ times a week). To prevent the need to replace them even more frequently, be sure that you are taking care of them properly. How often should I use a facial brush? I am frequently asked by people if they can use a facial brush every day. The answer is YES! A facial brush is a great addition to your daily skincare routine. For the best results, use it at least once a day. 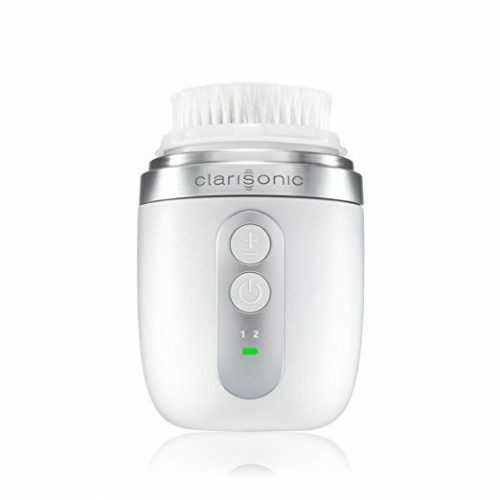 Some brushes, such as the Clarisonic Mia2, are actually gentle enough to be used twice a day. However, if you have never used a facial brush before, or haven’t in a long while, you should work your way up to daily use. Start by using it 2-3 times a week for the first week, then 3-5 times for the second week, and 5-7 times for the third week. I recommend using it in the evening if you’re going for once a day, as they are great for cleaning off the day, and your makeup, from your skin. They also help prep your skin for better absorption of your favorite moisturizer, lotion, serum, and other products you use before bed. What cleanser should I use with a facial brush? One of the great things about facial brushes is that you are able to use your favorite cleanser with them. However, this does not mean that all cleansers are created equal. If the facial brush you buy comes with a cleanser, I always recommend giving that one a try first. If you like it, awesome! If not, don’t worry – you have plenty of choices. While you can use whatever you happen to have on hand, it pays to use a good quality cleanser. 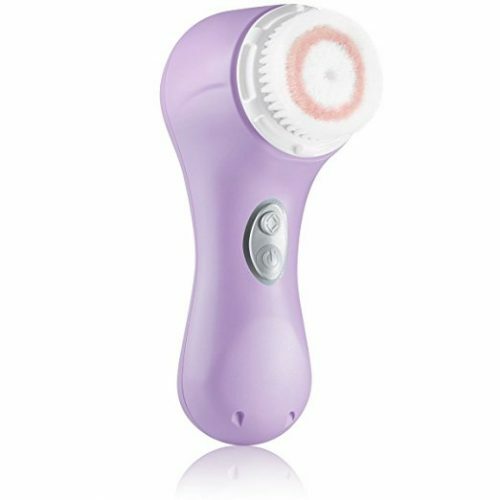 The facial brush cleans your pores and exfoliates your skin, which makes it better able to absorb anything you put on it. Due to that, you want to be using the best products available. You can view some of my favorites here. 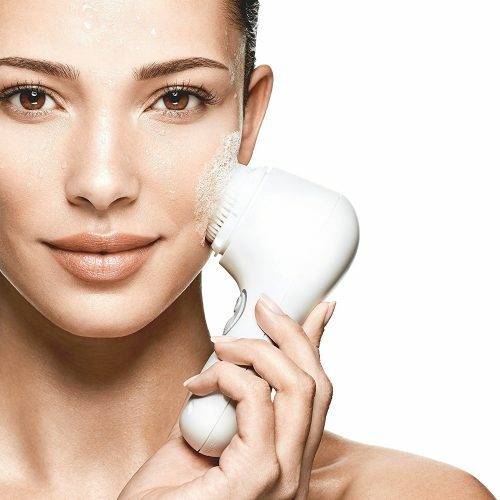 Can I use a facial brush on other parts of my body? Yes! While they are not meant for this (and there are products that are meant for this use), it is possible to use a facial brush on other areas of your body, such as your arms or legs. However, since facial brushes are meant for your face, which is more sensitive, you will likely find that the power is lacking if you use it elsewhere. A facial brush is a great investment if you are looking to have a cleaner, brighter face, which will leave you with healthier, younger-looking skin. 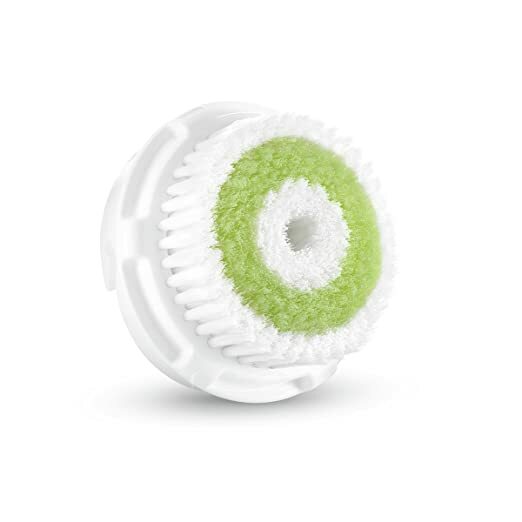 A facial brush will help you to clean your face much better than you could with just a washcloth or your hands. They are also fast and easy to use, easily working their way into your current skincare routine. Check them out today!